This free voice add-on gives MorphVOX, seven new voice transformations. 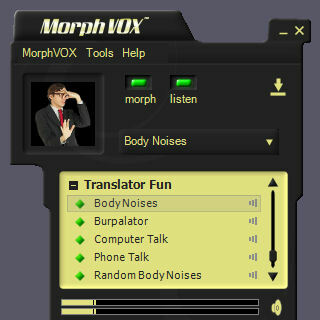 From the makers of MorphVOX, this add-on will let you translate your voice into computer beeps, touch-tone phones or let out random farts without eating beans. Be the first to annoy your IM buddies. The add-on contains the following translations: Body Noises, Burpalator, Computer Talk, Phone Talk, Random Body Noises, Random Censor, Xylophone. Note: This add-on requires the full version of MorphVOX 2.0 or above. Page loaded in 1.257 seconds.